HEALTH Cheese that's good for you ?? FRENCH CHEFS EMBRACING HIMALAYAN YAK CHEESE "Yak cheese is considered a rare delicacy with great health benefits,” the menu reads. It’s offered either grated in a plate of truffled pasta, or on its own for $10 an ounce. RAGYA MONASTERY MONK MADE This Monk cheese from Ragya Monastery supports the local nomadic communities in the Golok region and the largest private Tibetan school on the Plateau. TASTING NOTES ON HIMALAYAN YAK CHEESE Exceptional chefs, cheese makers, and mongers weigh in on Himalayan Yak cheese. YAK CHEESE FOR HEALTH Research results suggest that cheese from yak, grazed on Himalayan alpine pastures, have a more healthful fatty acid composition compared to cheese manufactured from dairy cattle. ART FOR TIBETAN CHEESE There is no Tibetan equivalent for the word “art” as it is known in the West. The closest approximation is lha dri pa, literally, “to draw a deity.” These artists are helping by drawing the deity for Ragya and Prairie Sky. WELCOME TO PRAIRIE SKY Prairie Sky is a sanctuary and family run Tibetan yak and horse ranch on 83 acres in the heart of Amish country in the picturesque Driftless Region of Southwestern Wisconsin. 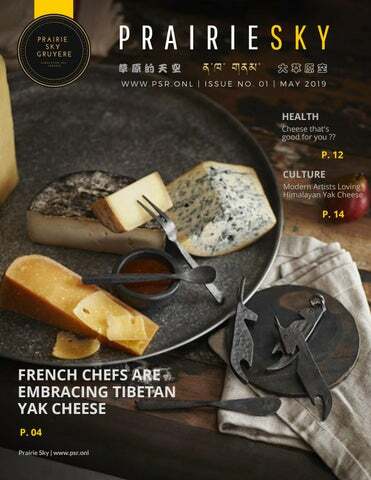 French Chefs Embracing Himalayan Yak Cheese BY HUGH MERWIN, GRUB STREET Yak cheese is a hit in Midtown Manhattan. Aldo Sohm Wine Bar embodies the energy of New York where the laid back atmosphere invites you to: drink, eat, share, relax and enjoy. "Yak cheese is considered a rare delicacy with great health benefits,” the menu reads. It’s offered either grated in a plate of truffled pasta, or on its own for $10 an ounce. In case you need a little more incentive to give it a try. Chef Eric Ripert, of Le Bernardin fame, describes the cheese as having a complex and subtle flavor.“It’s much milder and more delicate than Parmesan,” he says. “In Beijing, it’s prized.” "The wine bar will actually help expose yak cheese to perhaps its biggest audience outside the Himalayas — just as soon as the next few wheels clear customs." We don't often consider the spiritual nature of a place when we discuss terroir. In Lamaistic Buddhism, as well as in Hinduism, the Jomo Tserigma (ཇོ་མོ་ལྷ་རི), or Gaurishankar, is a very sacred place. It is known to Buddhist Sherpas as Jomo Tseringma: Jomo referring to the Goddess, and Gang-kar meaning, "as white as snow". So, the mountain is: Snow-white Holy Mother. The Khumbu valley itself is a sacred place according to ancient Buddhist scriptures. Lama Sangwa Dorje left a foot print here in the rock while meditating. "The foot print in rock is still visible today." Lama Dorje's divine psychic knowledge and clairvoyant vision prophesied the monastery at Tengboche. Indeed, later the monastery was established by Norbu (Dorje's fifth incarnation) at its present location in 1916. The foot print in rock is still visible today! MADE FOR PRAIRIE SKY Our cheese most resembles a quality, aged Gruyère or Comté and comes from a tradition introduced by Dutch, French and Swiss expatriates traveling and living on this Tibetan - Nepalese boarder. The central town of Jiri was set up as agricultural development centre by the Swiss Government Aid in 1938. This European influence persists in our cheeses today. The first western style cheese was produced here in 1951 and the techniques was perfected over the next 4 decades. The Affinage was established in 1993. These cheese caves are located at 9,000 feet above sea level in the village of Sherpa in the shadow of Everest. They produce premium, handmade cheeses that marry artisanal Swiss tradition with the terroir of the Himalayas. Ragya Monastery Monk Made Cheese VEN. JIGMA GYALSEN This fusion of the old and the new, the local and the global, which is crystallized in The Tibetan Yak Cheese Project, underlies all of Jigme Gyaltsen’s efforts as he seeks to create “a model that unites tradition with modern culture and promotes them simultaneously.” In addition to supporting local nomads, the The Tibetan Yak cheese project supports his schools. “I started the Jigme Gyalsen Nationalities Vocational School in 1994 out of a wish to contribute to the promotion of Tibetan culture and education,” he says, explaining his unique role as a monk headmaster of a secular school. “In general,” he continues, “as a monk I should focus on monastic studies, uphold relevant rules and regulations. If I could practice meditation that would be wonderful, but if not, as a monk, I try to undertake things that are beneficial to others. For a nationality, a region, or a country the foundation of its development rests on education.” For both lay and monastic students an education at The Jigme Gyaltsen Vocational School or The Prairie Talent Girls’ School is a unique opportunity to learn both about traditional Tibetan culture. This what Jigme Gyaltsen calls “the cultural knowledge of this new century.” - using the centuries-old techniques of Buddhist debate to teach contemporary subjects. TOP THREE REASONS HIMALAYAN CHEESE IS ETHICAL Benefits Ragya & Tibetan Nomads One dollar of every purchase is donated back to support the nomadic communities below Everest and in the Golok prefecture of the Qinghai Plateau. Many Tibetans are displaced. By purchasing yak cheese you are supporting the traditional lifestyle and the economic system that underlies these alpine communities. You also directly support Ragya Monastery and communities in this region by providing a traditional education to rural families. Yak Cheese is Green (I mean, Sustainable) This cheese is made from Free range, grass fed yak. They are raised on organic, non GMO feed with no Growth Hormones (rBGH) and No antibiotics. Research also shows that yak creates less methane and require less hay and pasture resources than traditional dairy cows and beef cattle. Grass fed dairy also contains a larger diversity of nutrients. including vitamins A, D, B-12, and other vitamins, minerals, phytonutrients and antioxidants in addition to calcium and protein. Every purchase supports something. Discover why supporting Fairly Trade Himalayan yak cheese means making a positive impact on the Roof of the World. This cheese directly supports the threatened, traditional nomadic lifestyle on the Tibetan Plateau. At the mention of terms like “farm-to-table,” people think they’re being thoughtful about where their food comes from. We talk about new-American cuisine, farmers’ markets, “real food,” and the next best thing when it comes to restaurants. The thing is, food is more political than Becky with the wheatgrass may lead us to believe. And there’s a lot missing from conventional conversations about food – even in our more thoughtful discussions. Food has a human cost and these are expressed in food politics. The politics can be affected by the ethical, cultural, medical and environmental disputes concerning proper farming, agricultural and retailing methods and regulations. There's a good reason to give ethical consideration to the sourcing of your food. Himalayan Yak Cheese is politically clean. In addition to being Organic and Hand-crafted, it is Fairly traded and provides support to education and donations to Tibetan nomads in the Himalayas. So, become a Political foodie - just don't call it that. Fair trade is an arrangement designed to help producers in developing countries achieve better trading conditions. Members of the fair trade movement. advocate the payment of higher prices to exporters, as well as improved social and environmental standards. The Making of Gourmet Nomadic Cheese MAKING ALPINE CHEESE AT EVEREST Himalayan Yak Gruyère, is made from raw yak milk. The raw milk is heated to 34 °C (93 °F) in a copper vat, and then curdled by the addition of liquid rennet. The curd is cut up into pea sized pieces and stirred, releasing whey. The curd is cooked at 109 °F, and raised quickly to 129 °F. The whey is strained, and the curds placed into molds to be pressed. After salting in brine and smearing with bacteria, the cheese is ripened for two months at room temperature, on wooden boards, turning every couple of days to ensure even moisture distribution. SHERPA AFFINAGE AT EVEREST Himalayan Yak Gruyère is cured for 8-10 months. The Long curing produces a cheese with a smooth and intense flavor. Our Gruyere has a light fruity flavor at the forefront, then finishes with a sweet, nutty taste. The affinage cellars are an important and the longest part, of the production of the Himalayan Yak Gruyere. Accordingly, to mature a Himalayan Gruyère the cellars must have a climate close to that of a natural cave. This means that the humidity should be between 94% and 98%. If the humidity is lower, the cheese dries out. If the humidity is too high, the cheese does not mature and becomes smeary and gluey. The temperature of the caves are kept between 13 °C (55 °F) and 14 °C (57 °F). This relatively high temperature is required for excellent quality cheese and is particularly important for aged cheeses. Lower quality cheeses result from temperatures between 10 °C (50 °F) and 12 °C (54 °F). The lower the temperature is, the less the cheese matures, resulting in a texture that is more crumbly. Yak Cheese for HEALTH STEVE MIRSKI, SCIENTIFIC AMERICAN Researchers writing in the Journal of Agricultural and Food Chemistry report that the shaggy beasts from Tibet and Nepal produce cheese that is high in polyunsaturated fat. It also has four times more conjugated linoleic acid than dairy cattle cheese. Linoleic acid may help ward off heart disease. “Yak cheese tastes like a medium cheddar with a smooth, uniform texture.” DR BRIAN MCBRIDE, UNIVERSITY OF GUELPH, ONTARIO CANADA Yak cheese is made and sold in Nepal and Tibet and is in high demand — it could be part of the fuel that helps power Nepalese sherpas up Mt. Everest —but you can find it some gourmet food stores and restraunts in the US. It may be a while before these beasts from the roof of Asia populate places like America’s Dairyland, but the idea could have farmers yakking. I'm thrilled. A heart heathy cheese for a cheese lover is a real joy, and the flavor - a revelation. Cheese that's Good For you? LOUISE CHENG, WEBMD Yak cheese may have certain nutritional advantages over conventional cheddar cheese, a new study shows. Researchers in Canada and Nepal compared the fatty acid profiles of two types of cheese: Yak cheese made from milk of yaks grazing on grasses in Nepal's highlands, and Cheddar cheese made from milk of Canadian dairy cows fed grain mix. The yak cheese was three times higher in omega-3 fatty acids than the cheddar cheese. Omega-3 fatty acids have been studied for various health benefits, including heart health. In particular, yak cheese was rich in alpha-linolenic acid (ALA), a type of omega-3 fatty acid also found in flaxseeds and other plants. Yak cheese was also richer in conjugated linoleic acid (CLA), which has been shown to have "a range of positive health benefits" against cancer, body fat gain, type 2 diabetes according to researchers. "The results suggest that cheese from yak, grazed on Himalayan alpine pastures, may have a more healthful fatty acid composition compared to cheese manufactured from dairy cattle fed grainbased diets," the study states. McBride's team didn't compare cheese from grass-fed cows to yak cheese. But the findings aren't just about what the yaks and cows ate, according to McBride. are individually shaped dumplings usually with a yak meat or yak cheese filling. No celebration or special occasion passes without some of these delicious dumplings. Eric Wu is one of Lhasa’s leading chefs. His yak momos are an example of his traditional dishes and a contemporary twist. to HHDL. by Plachinka. Mmmm. of the 2018 Season Finale. ART for Tibetan Yak Cheese There is no Tibetan equivalent for the word “art” as it is known in the West. The closest approximation is lha dri pa, literally, “to draw a deity.” Traditionally, neither the Tibetan language nor the Tibetan cultural framework has recognized art for art’s sake, and an artist’s efficacy rests in his ability to precisely replicate an established visual language and portray the essence of a particular deity. These artists are drawing down the deity for Ragya Monastery and Prairie Sky Ranch. ANG TSHERIN SHERPA Tsherin Sherpa was born in Kathmandu, Nepal, in 1968 and was trained from a young age in the art of traditional Tibetan thangka painting under the guidance of his father, Urgen Dorje, a renowned tangka artist from Nyalam, Tibet. Tsherin travelled to the United States in 1998 and worked as an artist and instructor at the Healing Buddha Center in California. He currently lives in Oakland, California. Preparation Rub the inside of a saucepan with the garlic halves; discard the garlic. Mix the Himalayan Yak Gruyère and the Emmental with the cornflour and set aside. Pour the wine and lemon juice into the pan, set over medium heat and bring to a simmer. Owners' note Prairie Sky is a sanctuary and family run horse and yak ranch on 83 acres in the heart of Amish country in the picturesque Driftless Region of Southwestern Wisconsin. We are restoring historic pineoak savanna as natural habitat for threatened local species, protecting butterflies, raising tibetan yak as bisonreplacement on the prairie. Bordering the Blue River Sand Reserve, the Wisconsin Riverway and the Mighty Mississippi, it is home to me, my husband Dan and my two dogs Bobo and Coco. It is also where we breed our 2 herds of Tibetan yak, as well as Thoroughbred, Friesian horses and butterflies. Bordered by 95,000 acres of pine and hardwood forests, crystal clear trout streams and rivers, and the 92 miles of the pristine Wisconsin River shoreline of a national park, it is the setting of a truly peaceful lifestyle. We are avid supporters of International Yak Association (IYAK), Board members and yak lovers. We love to talk about yak and are always available to answer questions or provide resources.